See more objects with the tag graphic design, grid, typography, concert poster, graphic designers, system. See more objects with the color gainsboro mediumseagreen dimgrey darkslategrey darkslategrey or see all the colors for this object. This is a Poster. It was designed by Experimental Jetset, Marieke Stolk, Erwin Brinkers and Danny van den Dungen and printed by Kees Maas and made for (as the client) Paradiso. It is dated 1996 and we acquired it in 2014. Its medium is die-cut screenprint on paper. It is a part of the Drawings, Prints, and Graphic Design department. The rock concert venue Paradiso, located in a former church in Amsterdam, opened in 1968. Since that time, it has played a significant role in the Dutch rock- and counter-culture. The venue describes itself as a "pop podium, a club and a cultural center in one." 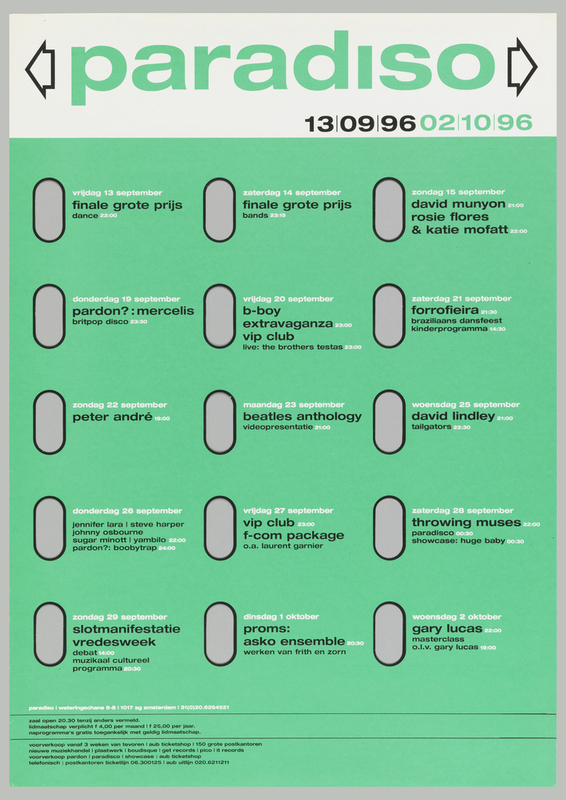 Experimental Jetset’s relationship with Paradiso began in 1995, when they started designing posters and flyers for the venue’s programming. At the time, they were still students at the Rietveld Academy. 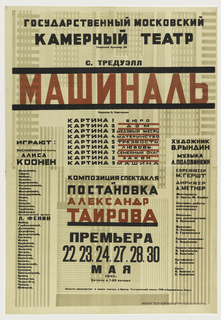 In 1996, the team was commissioned to produce a template for a poster series that would announce three weeks of upcoming concerts. The designers took into consideration the way the posters would likely be displayed, hung over other posters on walls in bars and music stores. 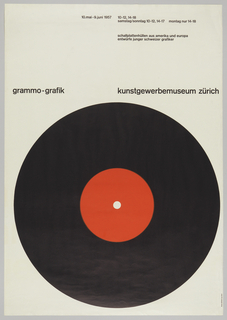 With that in mind, Experimental Jetset decided to create a template incorporating capsule-shaped holes punctured into the paper, allowing the layers of posters or the colors of the walls beneath them to show through, making each individually hung poster its own unique entity. Outside the venue itself, where the flyers were often hung in groups side by side. The colors and textures were exposed through the holes in the flyers creating a rhythmic tunneling effect. 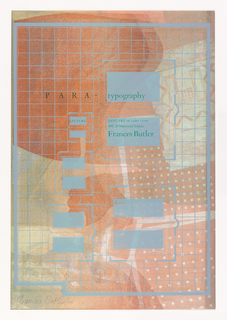 By puncturing the paper, the designers were able to play with a dimensional effect through a flat poster. 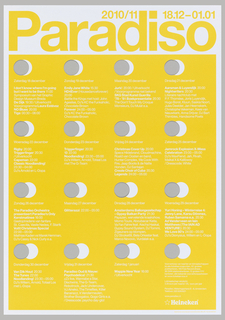 Although each poster represented a fixed period of time in Paradiso’s concert schedule, Experimental Jetset wanted to emphasize that it was simply a moment in a timeline that stretched back into the past and looked forward into the future. To suggest this sense of continuous time, they placed arrows on either side of the word "Paradiso", riffing off the stereophonic' mark that sometimes appears on record sleeves. Each poster in the series was screenprinted by the printer Kees Maas and each poster was designed with a different color for the background and text. 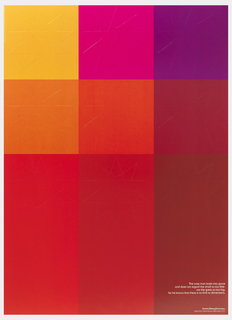 After creating the first few posters in the series, Experimental Jetset turned the template over to Paradiso, whose in house team continued to generate posters using the template until 2010, when the designers were asked to re-design and update the template. This object was donated by Experimental Jetset. It is credited Gift of Experimental Jetset. 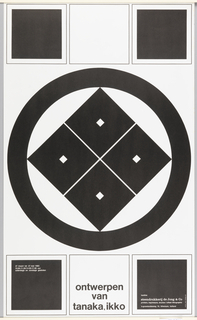 die-cut offset lithograph on paper. Museum purchase through gift of Lucy Work Hewitt. offset lithography on white paper.